This entry was posted on February 3, 2015 by Melinda. It was filed under food, still life, texture, Texture Tuesday, The Studio . Cool light creates “morning.” The plump berries glisten and glow. The white bowl implies sugar and sweetness. 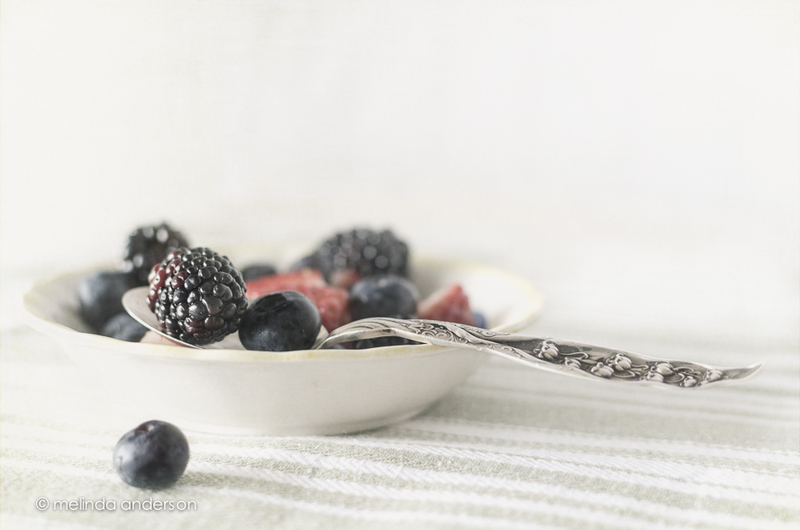 The rough texture of the cloth contrasts with the smoothness of the bowl and berries. But the star is the spoon: sterling silver by Whiting, very old, Lily of the Valley, art nouveau… adding to the nostalgia of a bowl of summer berries, in grandma’s kitchen? Gosh Melinda so love this image, the focus the DoF gosh just gorgeous. Love that spoon and your beautiful image!! Gorgeous image! I love the design of that spoon – so pretty! It looks like a commercial for fresh fruit….makes me want some. YUMMY ! Beautiful…..and so is the spoon. Absolutely beautiful. I love seeing the silverware showing up in so many photographs lately. I’m a collector, and it’s fun to see so many of my favorite floral patterns.